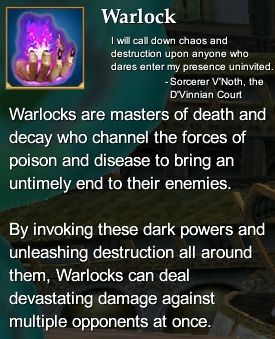 From the Everquest 2 player manual: "Those who desire to wield the dark forces of poison and decay to cripple and obliterate their foes will find the Warlock profession to be ideal. Wielding curses, summoning minions from the abyss, and calling upon the destructive forces of the void and the darkness, these mages are most effective when they rain down debilitation and damage upon entire groups of enemies at once." Warlock Epic Weapon Series (80) - Rise of Kunark Warlock Epic Weapon. This page last modified 2011-08-25 22:54:20.